Consuming foods in their whole form as nature intended provides vitamins, minerals, antioxidants, and enzymes that work synergistically to deliver the nutrition our bodies require. Studies show that most of us do not eat the recommended servings of fruits and vegetables each day to support optimal health. Much of our diet consists of poor quality processed foods devoid of nutrients. Even when we do eat a largely plant-based diet, unless we are consuming organically grown food, we may still be lacking the nutrients we need based on food grown in depleted soil, long transit times for delivery, overcooking, or stress induced digestive issues. Quality whole food-based supplements can improve our chances of getting the nutrients we need to achieve or maintain a better level of wellness. Given proper nutrition, the human body has the amazing ability to heal itself. 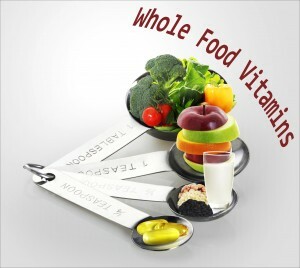 Whole food supplements are made with concentrated foods harvested at the height of nutritional value in order to supply a multitude of the plant’s components. Zyflamend Whole Body by New Chapter – Zyflamend is a premier herbal supplement formulated to balance and promote a natural, healthy, well-functioning inflammation response for whole body wellness. Non-GMO Verified. Men’s Synbiotic Nutrients by Newmark – Men’s Synbiotic Nutrients supplies comprehensive organic whole food vitamins, minerals and herbs specifically targeted to support men’s health. This foundational supplement provides stress, cardiac, energy, immune, prostate and digestive support with multiple benefits for overall wellness. B-Complex by Innate Response Formulas – B- Complex is a 100% whole food supplement formulated to provide a balanced ratio of B vitamins and their inherent co-factors in their most bioavailable food forms. Non-GMO Verified. Every Woman’s One Daily by New Chapter – Every Woman’s One Daily is a whole food formula specifically designed for active women under the age of 40. Organic herbs and cultured whole food complexed vitamins and minerals work synergistically to promote calcium metabolism, support bone, hormonal and immune health and provide energy and stress support. Also available – Every Woman’s One Daily 40+ specifically formulated for women over 40. Non-GMO Verified. C-Complete Powder by Innate Response Formulas – C-Complete Powder delivers essential nutrients with a therapeutic blend of rich organic whole food sourced bioflavonoids and vitamin C. Naturally buffered to be gentle on the stomach, this premier biologically active formula promotes overall wellness and supports a healthy immune response. Barlean’s Greens by Barlean’s Organic Oils – Barlean’s Greens are formulated with nature’s most vitalizing plant-based ingredients to create a great-tasting premium superfood. This product contains an optimal blend of green food concentrates, vitamins, minerals, phytonutrients, herbal tonics and herbal antioxidants in a 95% organic, gluten-free and non-GMO formula. Kids Complete Multi-Powder by Innate Response – Kid’s Complete Multi-Powder is designed with whole food nutrients and bioactive vitamins and minerals to fill in nutritional gaps and support healthy, growing children. This great tasting formula provides immune supporting nutrients and provides foundational support for healthy development. PaleoReds by Designs for Health – PaleoReds is a high quality, whole food powder formulated with nutritionally dense, brightly colored fruits, vegetables and antioxidant-rich extracts. With over 70% organic ingredients, this great tasting product combines more than a dozen fruits and vegetables and their phytonutrients to help ward off free radical damage and reduce the risk of developing chronic diseases. This entry was posted in Health & Wellness, Home and tagged B Complex, Barlean's Greens, C-Complete Powder, Designs For Health, Every Woman's One Daily, Innate Response Formulas, Kids Complete Multi-Powder, Men's Synbiotic Nutrients, New Chapter, Newmark, PaleoReds, Professional Supplement Center, Vitamins and supplements, Whole Food Vitamins, www.professionalsupplementcenter.com, Zyflamend Whole Body. Bookmark the permalink.